To satisfy Vehicle Orientation requirements, Licensee must demonstrate familiarity with all of the vehicle’s primary controls such as pedals, steering, shifter, lights, etc. Driver must perform this orientation test for each vehicle entered in competition. Licensee must complete a Basic Driving Test, demonstrating the ability to start the vehicle, select gears, turn, brake, and stop proficiently. The Official will make one (1) run with the Licensee as a passenger. This will allow the Official to determine the safety and eligibility of the vehicle per ET limits, and orient the Licensee to track fixtures, starting line, timing system, return road, time slip booth, etc. The Licensee must take a minimum of three (3) approved runs with the Official as a co-driver. The Licensee must then take a minimum of three (3) approved runs with the assigned Co-Driver, witnessed by the Official. If passed, the Official and Co-Driver sign the driver’s license. Officials may deny a license to a driver if they feel the Licensee cannot handle the vehicle. Driver may only drive vehicle from the staging lanes, on the track, and on the return road as far as the time slip booth. The Co-Driver must drive the vehicle at all other times. SEAT BELTS: Mandatory for both driver and Co-Driver. VECHICLE: Must be a full-bodied car, truck, van or SUV. Convertibles, Jeeps, motorcycles, and race cars prohibited. Vehicle must pass IHRA Tech and State safety inspection. Vehicle must be licensed. Mufflers and street tires mandatory. Electronics prohibited. 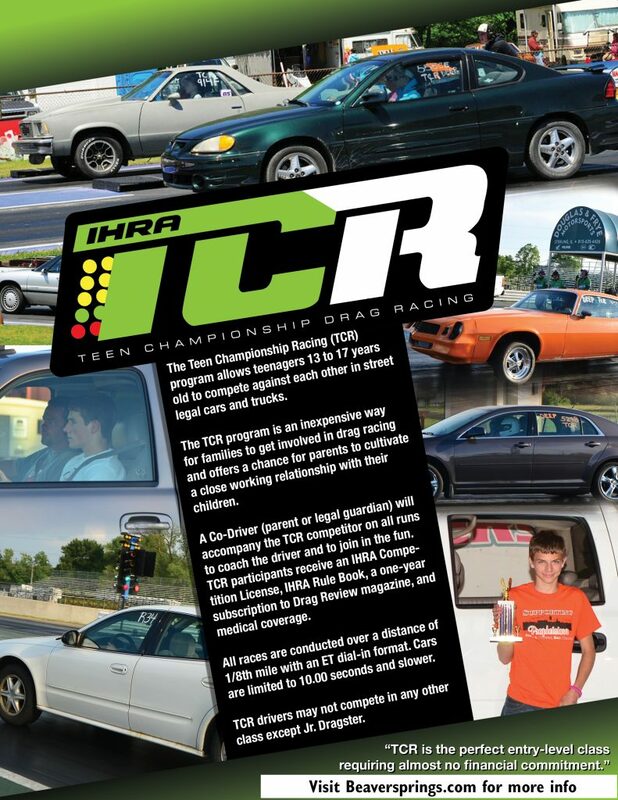 See page 18 of 2019 IHRA Rulebook for additional Information.